My bedroom system consists mostly of vintage Pioneer Silver era equipment. I use it for my alarm clock but it will rock out if need be. So I guess you could say I still like and use vintage gear. I've got all vintage stuff except for my CD player, a Pioneer DV-45. 4 Realistic Optimus-7 loudspeakers(3 way floorstanding model from '74)..., driven with the other PL 400. Don't laugh until you hear them, I almost didn't hook up the Klipsches! I have the speakers stacked with a pair of Opt-7's and a KG-4 on each side. Stands 7' tall, and sounds stunningly 3d. I love my vintage stuff. Almost as much as I love reconditioning it! I use JBL Century L-100's in our theater area daily. Bought new more than 30 years ago. The Dual Turntable and Sony Reel to Reel have been retired but I still have them. The Marantz 2230 receiver still works and is used in the bedroom. It only has 30 Watts per channel but looks good. My parents still have their 1966 solid wood console stereo system in there living room that they still use daily, They have a CD player hooked up to the tape line input and the turntable still works under the lid however it spins to fast and there records sound funny but I have not figured out how to slow it down for them (I had it all apart once to see if there was some sort of internal adjustment but found none). 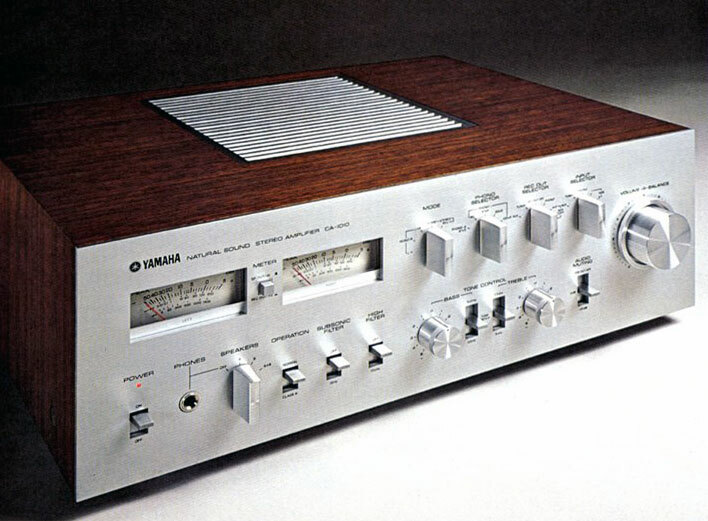 I still have the second stereo component I ever bought, a late 70s Marantz Model 1060 integrated amp. Rated for only 30 watts per channel but I'm sure it puts out a lot more than that. It's much heavier than you'd expect a 60-watt anything to be. It has pre-out and main in connections which have proved to be extremely useful over the years. I often use the amp section to power my bass guitar cabinet for home practicing. Right now I'm using it in a kind of "recording studio" I set up to transfer records and cassettes to CD, along with 90s vintage Pioneer three-head cassette deck and CD recorder. The turntable is a 1979 vintage Technics SL-3200 outfitted with a Shure V15 Type V-MR cartridge. It was the first and only turntable I've ever owned. Verry nices components to keep ! The CA1010 and CA2010 were classic, as were the NS1000. Great stuff, and many of them are still out there working great. I have a pair of Sansui SP-3000 speakers doing stereo duty in my shop. Believe me, we need the volume and these speakers fit the bill quite nicely. They lack a little on the low-end but in a loud work environment the bass would be drowned out anyway. These speakers work perfectly. Driving them is a Panasonic SA-H82 Hi-Fi Audio System. I just acquired a mint Sherwood S7200 receiver and B+W DM23 speakers for the bedroom. Lovely! WOW, I have not listened to those in years. Very good speakers. I got one for you, the old DC series CROWN amplifiers. I used to deejay with them, they were great. Also, Bob Carvers PHASE LINEAR amplifiers. More expensive, but wonderful.